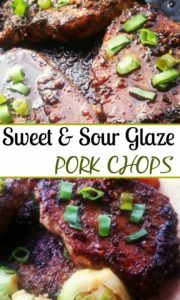 These Sweet & Sour Glazed Pork Chops are just delicious. It was so quick and easy within 20minutues I was done. I decided to pair it with some Brussel Sprouts and Carrots to make it a simple, delicious, healthy meal. 3 tbsp Sugar or Honey I used sugar brown sugar which is best for the substitute for honey. Season Pork Chops with salt, pepper and old bay seasoning. Add the butter to large skillet, add pork chops brown for 5 minutues until it's golden brown. 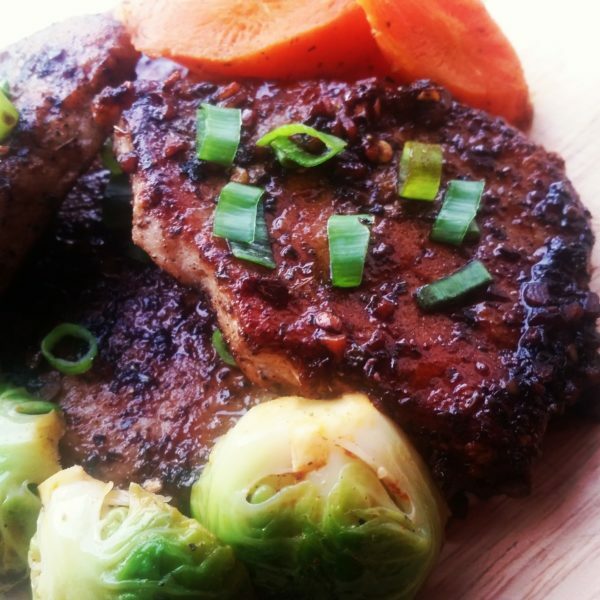 Place the Pork Chops in the oven and cook for 10 minutues. While the Pork Chop is roasting. Make the Sweet & Sour Glaze. Add basil, parsley, oregano, garlic, balsaimic vinegar, water, thyme, sugar or honey and salt and pepper to taste. Simmer for 5 minutues until glaze is thicken. Then add Pork Chops to the skillet and glaze the pork chops entirely. You can garnish to your liking. I on the otherhand used scallion.